Say hello to my first soil grown basil of this season! 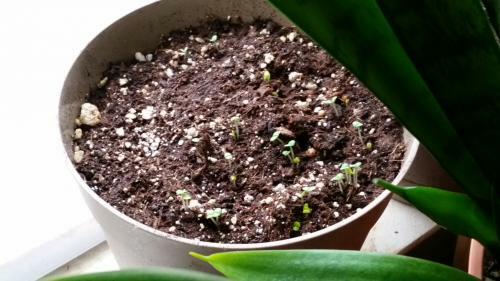 In this picture below are seedlings of Mrs Burn's Lemon Basil. 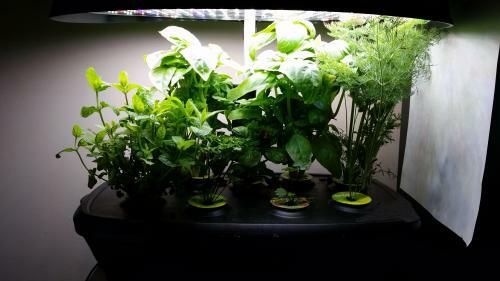 On the Aerogarden front, it has been sixty days since I first started the herbs. I've cut them back several times and they're growing just as strong as ever. I have, thanks to replacements from Aerogrow, 100% germination rates and even an extra pod of Curly Parsley growing off on the side in a medication bottle. The forecast for the Summer is one of long range high temperatures for my region. Hopefully, the peppers and basil will thrive with all the excess sunlight promised. I finally got it. 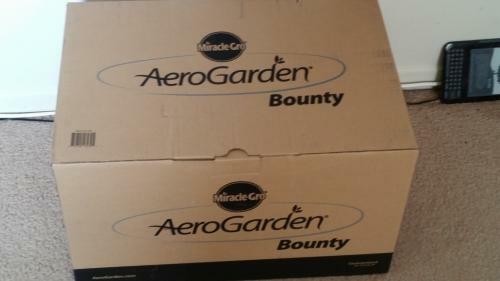 I finally got the Aerogarden Bounty. If you're wondering why it's still in the box, there are two reasons for that. 2. My "old" Aerogarden Ultra LED still has tomato plants ripening in it and I haven't deconstructed it yet. Everything is going into play on or before 12 March. I'm selectively pruning smaller tomatoes from these plants to force the others to ripen faster. I just ate three, not quite red tomatoes off of the vine. They tasted a lot like store bought tomatoes. If they're picking them at that point, it's no wonder they're so flavorless. I've been spoiled by vine ripened tomatoes. None but those can compete for flavor anymore in my eyes. On the Outdoor Gardening front, I've compiled a shopping list for myself of things to get in preparation of obtaining My Not So Secret Garden. The waiting list is one year or more and, even then, Senior Citizens have priority first refusal of plots. That should give me enough time to get together a good collection of tools before my name even comes up. I'm lucky I'm a very patient person.